As the headline says, robotic telepresence company Revolve Robotics recently announced the integration between the controls of its Kubi robotic telepresence platform and cloud-based videoconferencing provider Zoom’s video collaboration software. As you will see below this is noteworthy a few scores. However, before getting into the details a little context is in order. 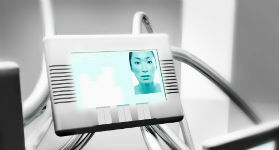 First, the term “robotic telepresence” may not be one that you have seen before. The reason is that in terms of providing a more immersive real-time interactive video communications experience the use of robotics is an emerging area. What it refers to is the ability for people at both ends of a video conference to have easy and responsive control over what they are seeing. The result is a much richer user experience than the typical static headshot one where either we must move and refocus our cameras or deal with sometimes klugy and slow to response room systems. In fact, the level of engagement and agility is basically non-intrusive in terms of session management and control. Pictured below is the Kubi. Don’t be deceived by the fact that it looks like a really well designed stand for a tablet or smartphone. The robotics piece and the software that allows it to work its magic are the secret sauce here (see embedded video). Second, in the name of full disclosure I am not part of TMC Labs, and hence am not usually involved in product evaluations. However, the nice folks at Revolve Robotics were kind enough to send me a Kubi and I am delighted they did. I like testing new products and services, however, I am more than occasionally digitally inept. For example it took me over an hour to get my Google Chromecast to work. This actually may make me the perfect subject. The good news is that it literally took me minutes to setup Kubi and I thoroughly enjoyed a very high quality session with Revolve’s Marcus Rosenthal CEO & Co-Founder and Ilya Polyakov, CTO & Co-Founder. As noted, Kubi is far from being a mere stand. It is a true robotic platform that can be “driven” by a remote video-conferencing participant. This is “see what I want to see” as remote users can “look around” the room and actively engage with meeting participants. In order to implement this integration, the Zoom development team accessed the open Kubi Application Programming Interface (API), which enabled full integration of Kubi controls into Zoom’s video collaboration client. Now, Kubi can be controlled from any Zoom client, including mobile clients. This is an instance where seeing is believing as the video below highlights. Kubi With Zoom Video from Revolve Robotics on Vimeo. Improved levels of engagement: It forces passive listeners to become engaged participants – a critical element for teams interacting with remote workers. Superior productivity: Controlling the camera is easy giving people the feeling everyone is in the same room. An added benefit is the ability to “teleport” from one Zoom on Kubi to another, whether it’s in the next room or around the world. Zoom on Kubi easily fits into the existing infrastructure of today’s enterprise: The solution leverages existing collaboration capabilities such as unified communications (UC) implementations, and it works with and adjust to any of today’s popular smart devices. It has been industry mantra for years that the goal of video conferencing was to create real-time experiences that were as close to “being there” as possible. The challenge has been over the years that between pricing constraints, networking issues, difficulties in moving cameras around, etc., the quality of user experience has been both costly and hardly truly immersive. Thanks to things like Apple’s Facetime and other real-time video interaction capabilities on our mobile phones, video is becoming commonplace for social interactions. However, it has remained a less than perfect experience for enterprises for cost and ease-of-use reasons and this combination of Kubi and Zoom certainly removes a lot of obstacles while delivering an experience that at least for me was superior to many I have been a part of that were on expensive room-based systems. Kubi means “neck” in Japanese, and if nothing else you may wish as I did to extend your neck a little bit and take the solution our for a test drive.